Student Work from IAC 2016! As summer comes to a close, I am reflecting on everything I learned these past few months as Visual Arts Faculty for the Junior Division at Interlochen Arts Camp. What these young artists were able to accomplish in the 3 all too short 2 week sessions is astounding. I will post later in detail about the individual projects we pursued, but for now I’d like to post a general highlight reel of their work. I taught three different classes: Cartooning (co-taught with Jessica Vacek), Drawing/Painting, and Printmaking (3x per day). My wonderful assistant was Jax Ohashi. The students I worked with ranged in age from 8 to 12 years, and came to Interlochen from all across the globe. It was an honor to teach them! Alex’s Advice Trading Card, plus Alex! I am writing to you as a Mills College MFA Student, expecting to proudly graduate in December with a degree in Book Art and Creative Writing. I am writing to you as a student that has had the rare and fulfilling experience of being completely in love with her school, its campus, its people, and the opportunities it bestowed. I am writing to you as a student that has, in the past week, watched as a great shadow fell upon her attitude towards Mills College, after its president shocked the Mills community with the announcement that the school planned to close the Book Art program. I have experienced in the seven days since this news was shared what feels like a journey through grief: denial, anger, depression… I cannot accept this news because I feel as though the Book Art Department has a great future, with much to accomplish and many lives to change. How could a medium that has had such a profound affect on my ability to reign in and share my voice be so depreciated? How could the faculty that have worked tirelessly to give us the most inspiring and thoughtful education imaginable be so undervalued? These are the questions I have been asking myself, with the realization that Mills does indeed need to make changes in order to survive and thrive, but knowing the wrong choices are being made, and all too quickly. I could share many personal stories and feelings about what Book Art means to me, and about my own experiences at Mills. But what I feel is most important to communicate to you, or what might best serve the program to share, are my thoughts on the school’s position that Book Art does not fit the spectrum of a 21st century curriculum at Mills College. I wholeheartedly disagree with this perspective, and urge you to reconsider closing this very important program. When I signed and shared the online petition to “Save the Mills College Book Art Program” on Change.org, I added the note: “The 21st century needs artists who can think creatively on multiple platforms, who can effectively and uniquely blend theory with craft, and who can articulate their intentions in a meaningful way. The Book Art program provides its students with these tools, and should be rewarded, not cut.” I passionately stand by this statement. Interestingly, I later researched the Mills College Mission Statement in an effort to address each of its points and how they relate to Book Art. The first paragraph of the statement reads: “The College educates students to think critically and communicate responsibly and effectively, to accept the challenges of their creative visions, and to acquire the knowledge and skills necessary to effect thoughtful changes in a global, multicultural society.” These two statements seem remarkably similar to me. I feel as though the Book Art Department has guided me towards achieving each of the goals laid out in Mills’ mission statement. And though as an artist, entering the workforce can be a daunting, uncertain move, I feel that I am very much prepared for what is before me. I now have the skills and the confidence to perform and grow with a career in the arts, whether it be in design, publishing, teaching, studio art, etc. I have experienced a multifaceted education that has prepared me well, and gifted me with a range of options. Artists’ books take every possible form, participate in every possible convention of book making, every possible “ism” of mainstream art and literature, every possible mode of production, every shape, every degree of ephemerality or archival durability. […] In mapping out this initial definition my intention has been to demonstrate the incredible richness of artists’ books as a form which draws upon a wide spectrum of artistic activities, and yet, duplicates none of them. Artists’ books are a unique genre, […] a genre as little bound by constraints of medium or form as those more familiar rubrics “painting” and “sculpture.” It is an area which needs description, investigation, and critical attention before its specificity will emerge. Book Art, though it has an arguably rich history, is still very young as a medium, and artists’ books “… really did not exist in their current form before the 20th century,” (The Century of Artist’s Books, page 1). It is an ever-growing, evolving field that has an exciting newness about it. To eliminate the Book Art Department at Mills would be a great disservice both to its history and its future. International interest in Artist’s Books is broadening, as art schools are pushing for interdisciplinary explorations, and Artist’s Books are inherently cross-medium. 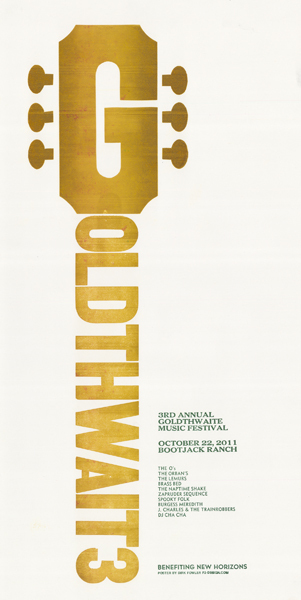 Mills College has been at the forefront of this exciting field, and is known worldwide for its unique Book Art program and its contributions to the greater Book Art community. Lastly, Mills should stand by the Book Art Department because Book Art is, historically, a medium pioneered and promoted by women artists. Book Art was developed as a field by women who felt the imperative need to share their voices and artistic visions, voices that had been historically silenced. Women’s Studio Workshop, founded as a studio workspace in 1974, is now the largest publisher of limited edition artists’ books in North America. Their mission statement “… is to operate and maintain an artists’ workspace that encourages the voice and vision of individual women artists, provides professional opportunities for artists at various stages of their careers, and promotes programs designed to stimulate public involvement, awareness, and support for the visual arts,” (wsworkshop.org). If Mills College seeks to promote the equality of women in artistic fields as it does in all other fields, then they should reconsider cutting a program that has made so many strides and achievements in this particular area. Thank you for taking the time to read my letter. I hope you will reconsider this decision and keep the Book Art Program and its rare and phenomenal faculty. It would be a shame to see a program that could and will promise so much good in the long run struck down to achieve short term goals. 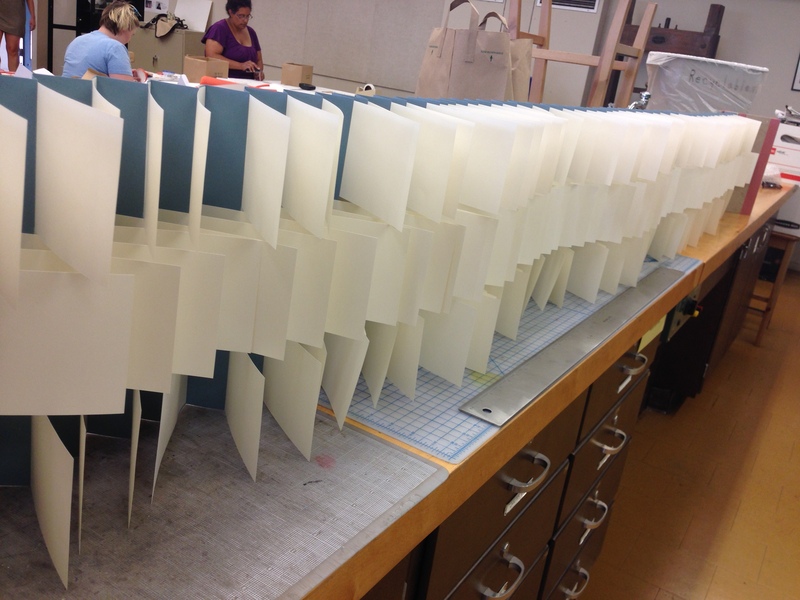 Please do what is best for the community at Mills College, and keep its highly regarded Book Art Department. I suppose I can call myself a reformed type enthusiast (mostly thanks to Kathy Walkup‘s “Visible Language” class at Mills). I used to stick mainly (okay, only) to polymer plates. Something about sitting there for hours with my back bent, taking fifteen minutes to create one line…yeah. But I now find it hard to say “Achk I hate type!” when I understand the history of the technology, and how it completely opened up the world of books, literacy, and the spreading of the written word. It’s hard to condemn something that is one of the greatest inventions in the history of mankind. Anywho, my first segway into appreciating metal type was not through historical research, but through using and appreciating wooden type. 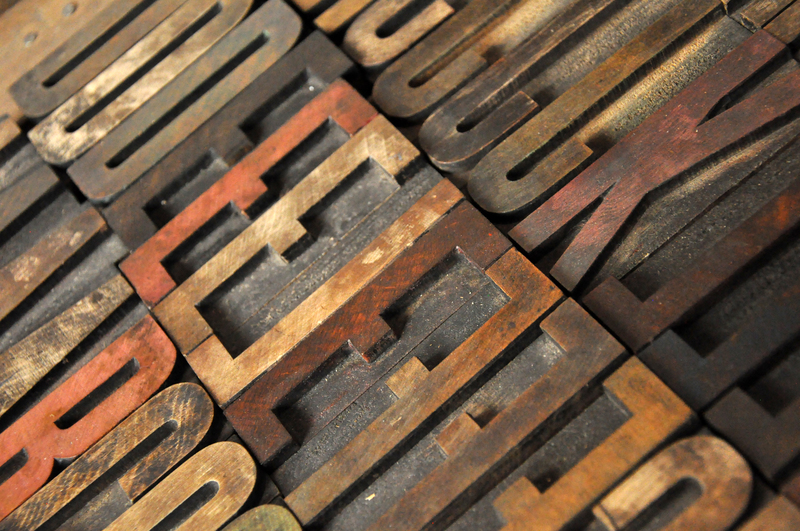 There is something about wood type – it is large, so it feels more like a building block… it’s tangible. 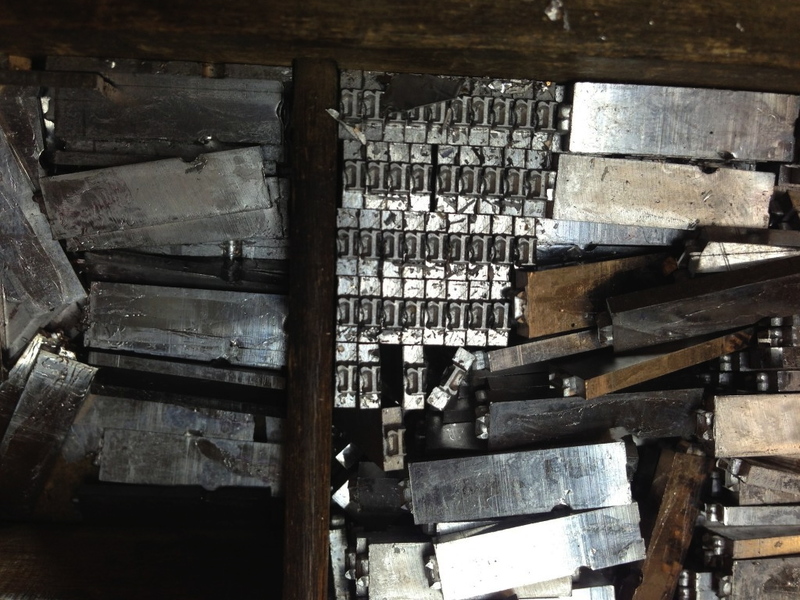 The letters are often imperfect, which actually gives them character and is often preferable to perfection (unlike lead type…damaged lead type is the worst. period.) With wooden type, the grain of the wood shows through. And as a relief printer, I love a good wood grain. So recently I have found myself playing around with wood type. As with any creative project, it is much more sans-stress when you do not have a specific final product in mind. Then you cannot let yourself down. Then it doesn’t have to be perfect. And as someone who has a few OCD tendencies (okay, a lot), this kind of process is very freeing. 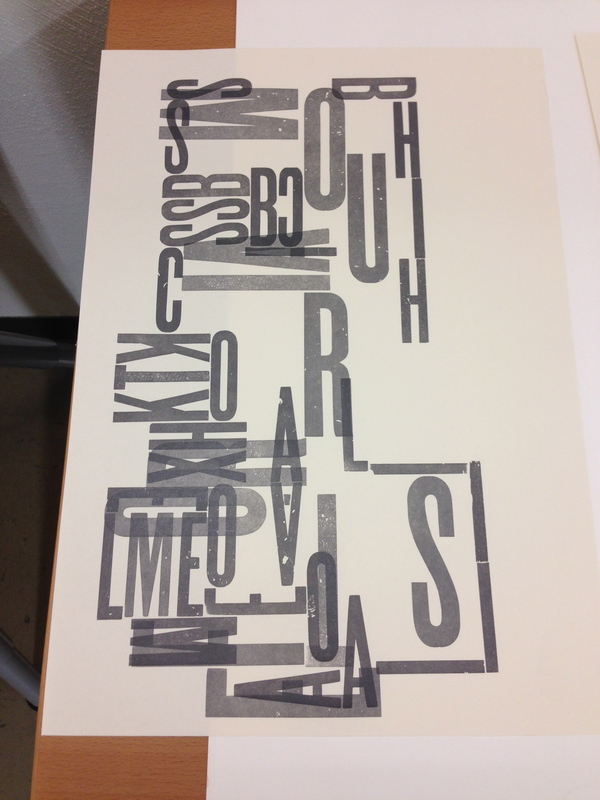 This piece is one of many collaborative prints done by our Visible Language class during a workshop with Dennis Ichiyama, an artist and professor known for experimenting with wood type. He told us about the Hamilton Wood Type & Printing Museum in Northern Wisconsin. 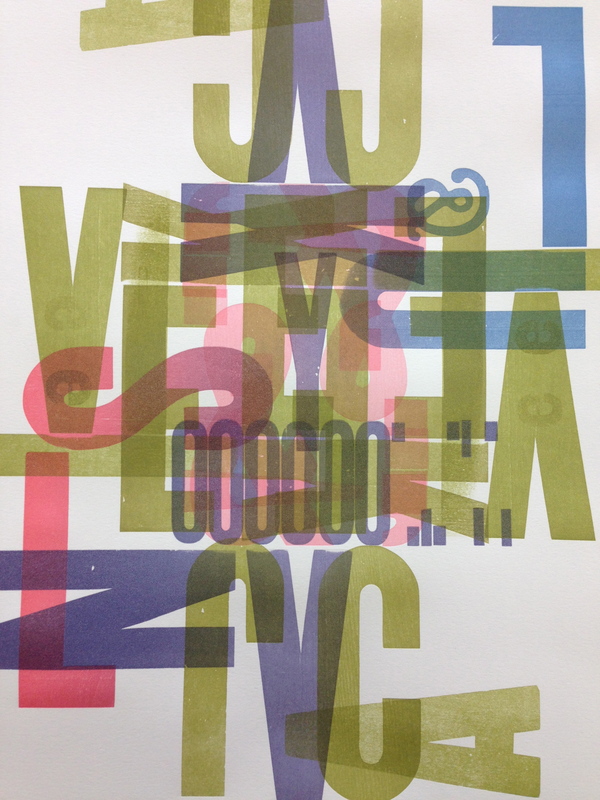 We had a lot of fun in the workshop trying to guess how a run through the press would alter the print… with frequent second passes after turning the sheet, we created some great symmetry! 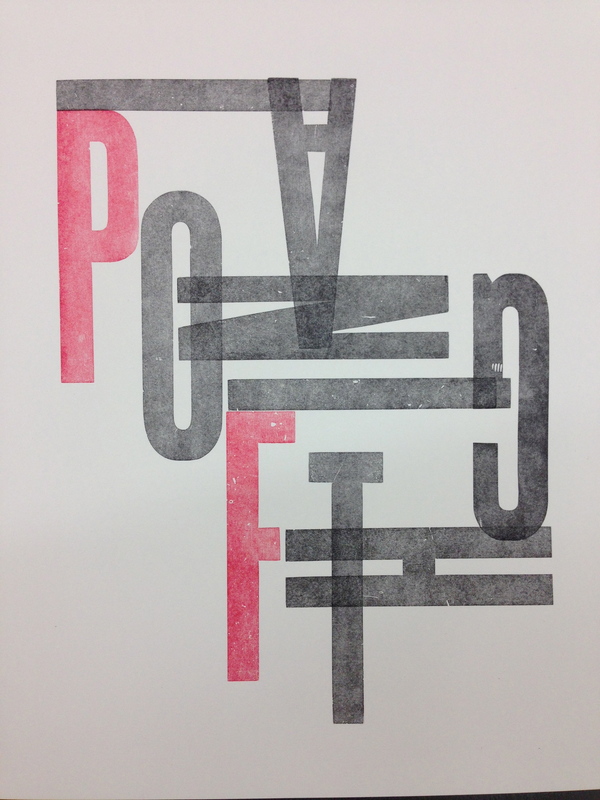 Here is a print I made that is meant to be a blueprint for our apartment. It took a little more planning (and I completely forgot it would print backwards… so it isn’t really our house after all!). I enjoyed creating certain relationships between rooms or areas and the letters that form them (like KTK for kitchen. and a giant S for “stuff,” because we are total hoarders). And, of course, I had to create one for Pianofight! I admit the preparation got a little tedious for this one, since it had to be so exact. 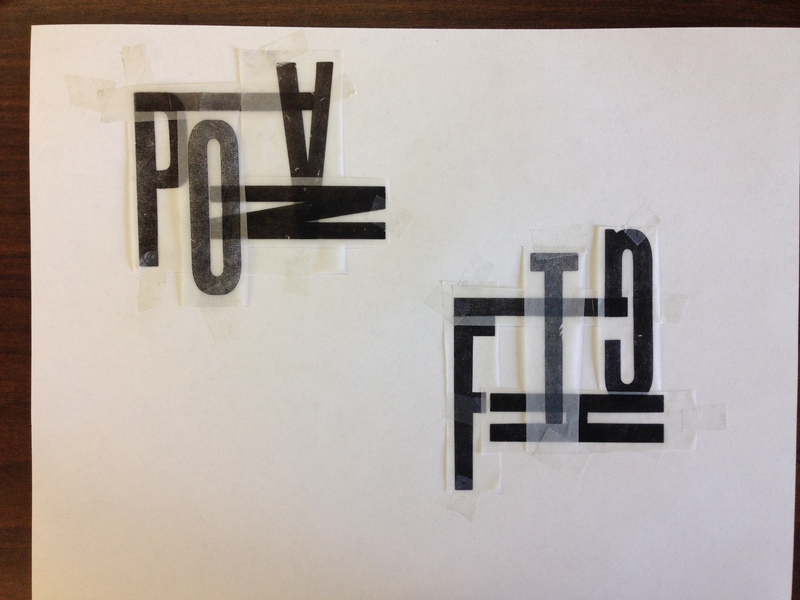 But what helped considerably was having cut-out letters printed on transparent sheets, so that I could plan exactly how they would fit together. Super pleased with the end result. Hope you got something good out of my nerdin’ out sesh. New year, new website design, new blog function! I hope the new year is bringing plenty of new adventures and opportunities your way. In my case, 2015 is going to be the year of my graduate thesis ideation and creation. I’m sure this will be the cause of all sorts of stresses and terrors and confusions in the months to come, but in this moment right now, I am eager to piece together the inspiration-filled tornado that is my graduate-student-brain. There will be many thesis updates to follow (I’ll try to keep them to the excited/happy kind). 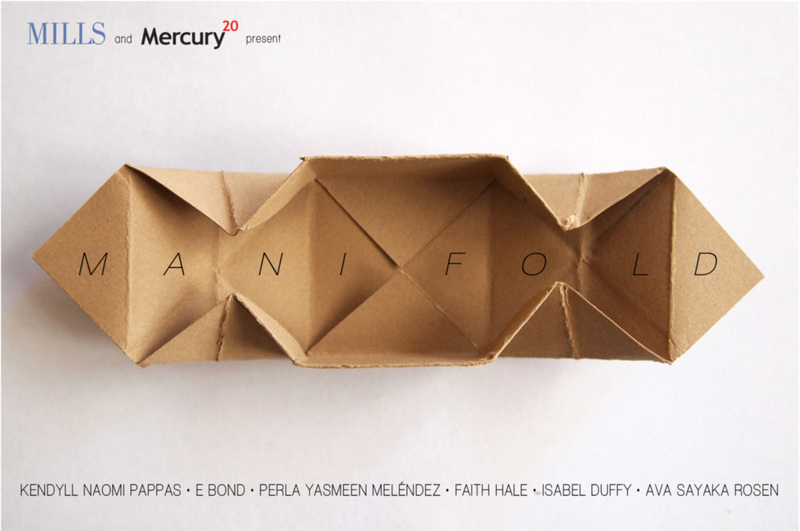 On a related note, the 3rd year students in the Book Art and Creative Writing MFA program at Mills College are about to have their thesis exhibit, Manifold. Which, if you can call yourself a Bay-Area-er, YOU SHOULD GO TO. 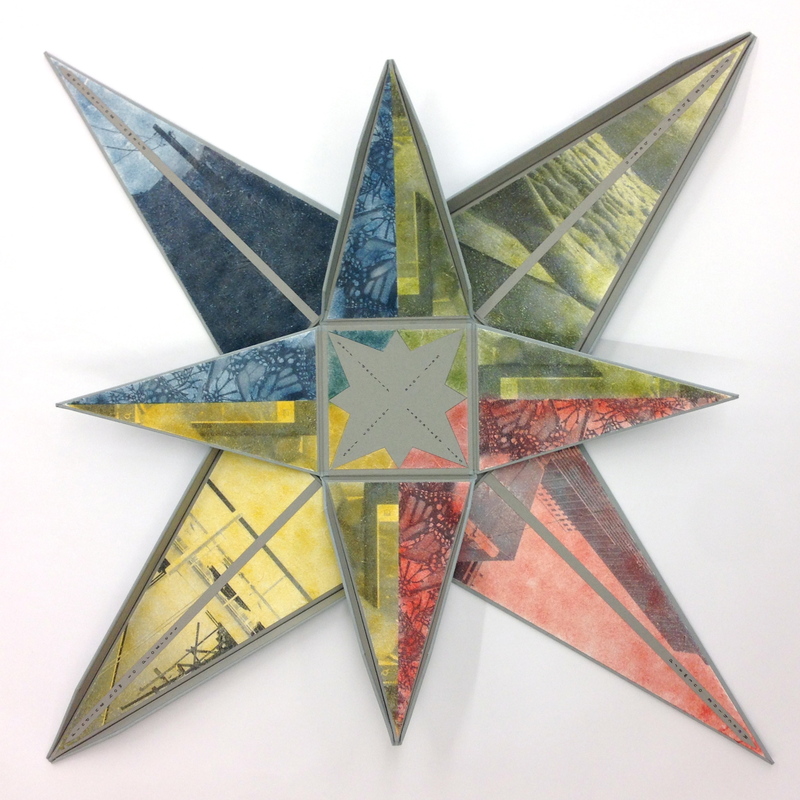 Opening reception is January 30, 5:30pm, at Mercury 20 Gallery in Oakland, CA. Click on the link to see the press release. company my husband and I are a part of, opened the doors to its much anticipated restaurant and artistic venue in December. And let me just say, it is beautiful. I mean, the space is really really ridiculously good looking. You should probably go check it out. 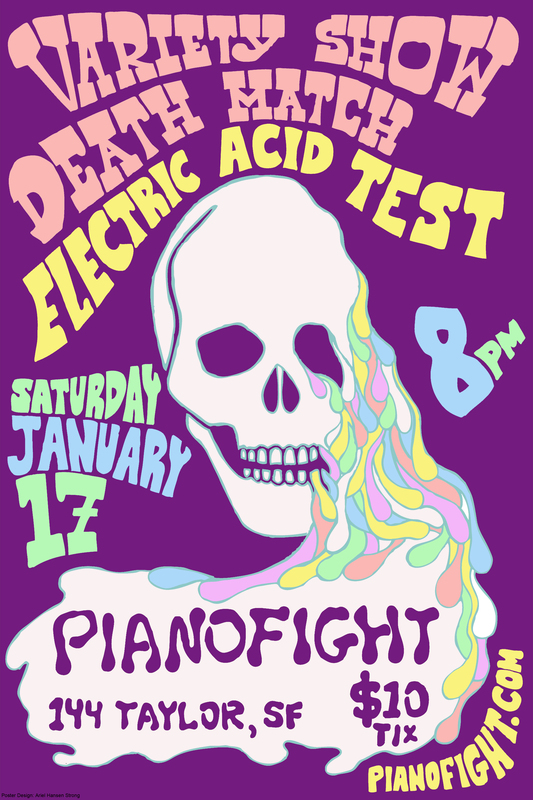 There are shows and events every weekend, including “Variety Show Death Match” on January 17, which my husband, Andy, is hosting (tix at www.pianofight.com. Poster by moi!). MUCH MUCH more from PF to come. I suppose this first blog post turned into more of an advertisement for a few local and radically great events. But what better way to start off the new year than to go out and experience new things?